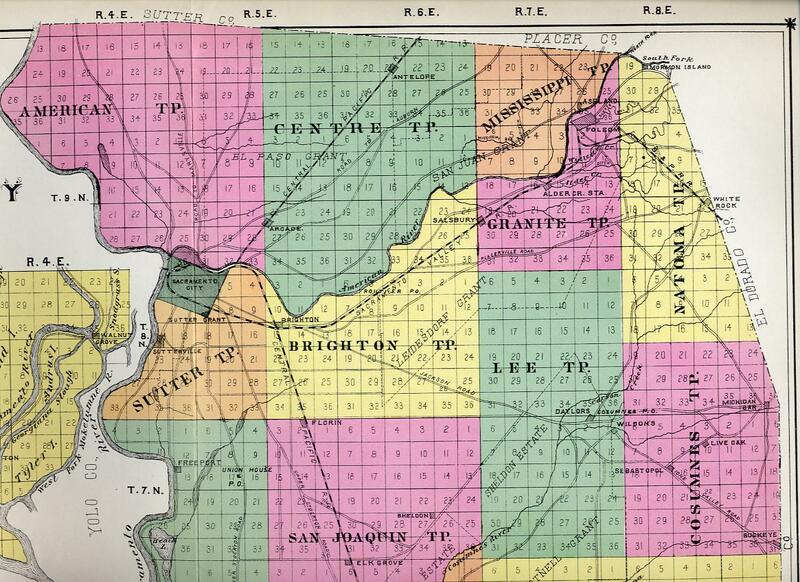 This 1880 Township map was printed in "The History of Sacramento County", Thompson & West, 1880, and is reprinted at Rootsweb's Sacramento site. The sister "Sunset Colonies" of Orangevale and Fair Oaks haven't appeared yet, but several landmarks show their future locations. First, remember the backward "S" curve in the American River. It is less severe on this map, probably because the lower parts of the river changed course somewhat during every flood. The backward "S" is just below the "S" in San Juan Grant, so the future site of Fair Oaks town would be just above, and across the river from, the Salisbury R.R. Station. Another point of reference on this map is the Alder Creek Station, just up the tracks from Salisbury. Alder Creek currently flows into Lake Natomas at Nimbus Flat Park, just uplake from Nimbus Dam. In later maps, it will be a good pointer to where Nimbus dam would be built. Other items of interest are Auburn Road, Antelope and what would become the Fair Oaks Road from Sacramento to the new community of Fair Oaks. According to the old timers, this road was very poor and impassable in the winter. The preferred route from Sacramento was the Folsom Road on the south side of the river or the Auburn Road.